I have seen atheists write “I believe in science because it works.” I have no problem in agreeing with this. Science does work – for certain practical things; so does plumbing and auto mechanics. However are there some situations where religion, and only religion, will work? I would like to briefly relate two stories, one about myself and one about a former coworker. My first wife and I divorced in 1991. She was also a convert to Judaism, however after 12 years as a Jew she regretted her decision and returned to being a gentile. We had no children after ten years of marriage. I was 31 at the time. I have had almost no contact with her since. However I was terribly disappointed and hurt. For months I felt suicidal. I reminded myself that suicide is prohibited my religion (“You will not murder” Exodus 20:12 includes suicide). Therefore, rather than escape my suffering, I would only compound it by committing suicide. I would be punished by God even after leaving this world. Also, greatly comforting me, close friends allowed me to live with them for several years until I remarried, fulfilling the religious commandment “Love your neighbor” (Leviticus 19:18). I was tempted to drown my sorrow in alcohol, however making vows prohibiting alcohol to myself stopped me, vows which I dared not to break due to the religious commandment in Numbers 30:3. Thank God, my life gradually got back on track. I kept my job and my sanity. I remarried to a lovely young woman in 1994. Soon after I switched to a much higher paying job at my present company. We now have three beautiful children and a beautiful home. In 2001, a beautiful 26-year-old woman I worked with divorced from her husband of eight years. She caught him cheating. They were also childless. Let’s call her Olga. Olga was raised in the Soviet Union with no religion. She was heartbroken by her divorce. She attempted suicide soon afterward. She was so distracted by her sorrow that she soon lost her job. She found work, however she was never able to have a stable relationship with a man after having been hurt. Recently, she has become unemployed again. She is drinking heavily. She has adamantly refused psychiatric treatment. Lately she has begun making threatening phone calls to former coworkers. There is a complaint pending against her for aggravated harassment (complaint #2815 with Officer Powlett badge #31995 of the 10th precinct Manhattan NYPD). She has been arrested. The long-term outlook for her doesn’t seem good. Olga and I both have all the advantages of modern science available to us. However is that always enough? Doesn’t this indeed demonstrate literally “Man does not live by bread only, but rather by every thing that proceeds out of the mouth of the LORD does man live.” Deuteronomy 8:3. I generally find that people who have gone through hardships in life have some of the most unshakable beliefs in a god (which is somewhat counter-intuitive). I too have gone through some tough times, but it wasn't my beliefs (I was a believer at the time) that got me through it, but more it was the people around me, and my own hopes. I won't deny that believing in god helps people in the way you've described, in fact in it may have evolved for that function, but I have also seen belief in god do some really bad things to people's minds when bad things happen, like blaming themselves because they have sinned when things go bad giving them unneeded guilt. As has been said a billion times before, just because an idea might help and give comfort, it doesn't make it true. And for many people it is more important that they have the truth, than them having potential comfort. I was tempted to drown my sorrow in alcohol, however making vows prohibiting alcohol to myself stopped me, vows which I dared not to break due to the religious commandment in Numbers 30:3. Anyone else with similar inclinations are advised to first talk to your LOR; taking a vow (shevuah or neder) is generally strongly condemned by our rabbanim. 'Science' is not a commodity, but a method of thought. To think scientifically is to observe events, think of patterns, raise hypotheses, and then test them. It allows us to use our knowledge and modify the knowledge with experience. Science is indeed a useful way of thinking. It is of course not enough to use science for everything. For example, I love my family and I do not think that I am thinking ‘scientifically’ in doing so. I enjoy reading JP’s blogs, and the Lord knows there no not much science is that either! Science is not the ‘be all and end all’ of all thought. Art, poetry, and philosophical discourse are all distinctly unscientific. As atheists and agnostics, we of course recognize this. Science is not everything! There is also no question that religion does have its uses. When your ship is sinking, faced with the certainty of death, it does not hurt to raise your arms and pray to something. It makes you feel good. Even the atheist manages to pray in a fox hole, the saying goes. The issue that we as atheists and agnostics raise is not whether religion has its uses. We recognize that it does. What we are questioning is the TRUTH of religion. For example, Ptolemy’s theory that the sun revolves around the earth certainly had its uses. The issue is that Ptolemy’s version of planetary motion was incorrect! That is the issue. I watch Sylvia Brown’s videos on youtube and see her audience, wide-eyed and full of wonder. I do not question the ‘value’ of her trade; I question its validity. Religion, JP, is no different than what Sylvia peddles. There have been scientific studies that show that break ups of long term relationships generally have a much heavier toll on women than on men. It would have been better if you had brought a example of another man in your situation who without religion ended up in the gutter. Orangetanos, Judaism urges people not to give into excessive guilt. See “Gateway to Happiness” by Rabbi Zelig Pliskin chapter 12. I haven’t noticed that problem in my community. Zbud, I find that vows are a powerful means of increasing self-control. Bad, of course there are bad religions as well. However out of about two million Orthodox Jews, I believe that only one (Yigal Amir) is currently serving a prison sentence for murder. By contrast, in 2002 from a US population of 280 million at that time, 148,300 were serving a sentence for murder. If all Americans were Orthodox Jews, the number would have been 140 – one thousand times smaller. Well I would agree with you about not accepting an authority's opinion on anything, if thats the point you are trying to make. If any atheists says that because scientists say something it must be true thus god does not exist, I would not hold that man in high regard. But if they are saying that some very smart people are saying that god does not exist, and that makes a good case for looking into their arguments, especially if it has something to do with their specialty (Evolutionist in terms of the origin of life, Cosmologist in terms of the origin of the universe.) than it gives their arguments weight. Science works in getting truth. Thats where it works. You are saying that religion works in helping and comforting, well that doesn't make something true, it does though make it comforting. Somebody telling their friend that they look great may be comforting and helpful and reassuring, it doesn't make it true. People I know that have the guilt problem don't make it obvious, a community wouldn't know about it. And they still have the problem no matter how many times you urge a person not to. Orange, I'm afraid I'll have to disagree with you a little. Evolution is clearly nothing more than atheistic propaganda, not science at all. All the appeals to authority and ad hominem arguments in the world don't change that. In your opening of the blog, you ask, "are there some situations where religion, and only religion, will work?" You then go on and explin all the things that you believe religion has done for you. I replied to your assertion by making a distinction between that which is comforting and that which is true. As an aside, I also mentioned that religion can have deleterious effects as well. Your reply is that orthodox Jewish murder rate is very low! All aside, forgetting about the topic at hand, do you, JP, think that your reply is in any way relevant to my comments? My comments were highly relevant and possibly even brilliant. I am pointing out that if one is inclined to be impressed by “appeal to authority” arguments, then one could appeal to religious authority as to scientific ones. What part of my comment was an 'appeal to authority'? What authority? I get too much spam then. 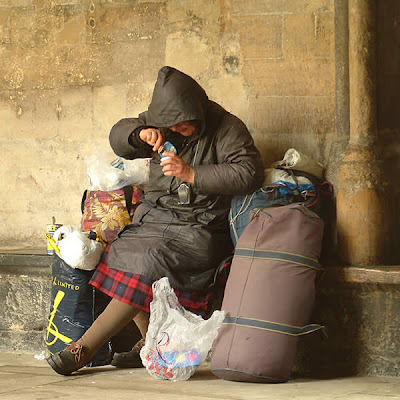 Yes, science can help the homeless woman. We could easily make enough food, clothes, accomodation, electricity, water, plumbing and transportation (trains, buses, bikes) for everyone. It's political will that's lacking. Now, capitalism can't be patched enough to eradicate poverty, and socialism/communism doesn't seem to work, so I don't know how to do it. You are presenting a false alternative: either suffer or believe a uplifting lie (if you get offended by "Judaism is a lie", think it'd work just as well with any religion you deem false). Did you look for third alternatives? I can think of some: supportive friends, antidepressants, hope for something possible (the best cure I know against suicidal thoughts is not "It'll make me suffer even worse", but "There is something awesome coming on and I want to live to see it"), losing yourself in some activity like your job or art. Also, even if it is the most efficient way out, you should not believe a lie, because on average, you should expect it to backfire more that help you. Not to mention the ethical value of truth. "you should not believe a lie, because on average, you should expect it to backfire more that help you"
Exactly, so why do all addiction recovery programs require a belief in God? Obviously, because it's not a lie. Why Take Chances with Eternity?